Branch Brook Park one of the most beautiful parks for running in New Jersey. Designed by the Olmsted Brothers in the late 1880s, the park is on the National Register of Historic Places. 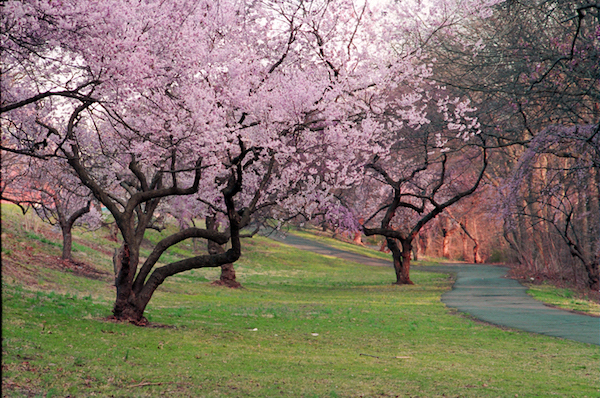 And here’s a fact: it has the largest collection of cherry trees in the United States! Other amenities include tennis courts, a roller rink, fitness course, and numerous fields. There are great paths for running in Branch Brook Park. A full loop of the paved perimeter path paralleling Branch Brook Dr. is just under 5 miles, with opportunities to add on. Most if the path also skirts a lake. Add-On: The Forest Hills neighborhood just to the north of the park is a classic older neighborhood with pleasant, leafy streets that are good for running. Light Rail: Bloomfield Ave., Park Ave., Davenport Ave.; Train: Newark Broad St. Parking in park as well.